You may be surprised to learn that you already have asset protection in place. In fact, you probably have one or more types of traditional asset protection planning in place at this very moment. The problem is it likely won’t be enough to protect you and your family. 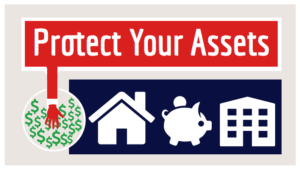 Asset protection planning takes many forms; in general, asset protection is action taken to preserve and protect your property in advance of a claim, or the threat of a claim. Asset protection planning will not be effective to shield your property from an existing claim. Instead, it must be done long before there is even the hint of a claim. What Is Traditional Asset Protection Planning, and Why Does It Often Fail? There are several types of traditional asset protection planning that have been around for years. The most common is liability insurance – automobile, homeowners, renters, business, umbrella, malpractice, and the like. You probably have at least one liability policy in place right now. Aside from this, liability insurance often fails because the coverage is inadequate, the policies have extensive exclusions, or the carrier becomes insolvent. Another common type of traditional asset protection planning is the use of a business entity (such as a corporation) to segregate business assets and liabilities from personal assets and liabilities. But while a corporation may shelter your personal assets from a lawsuit filed against the corporation, the opposite is not true – if you, as the shareholder of a corporation, are personally sued, your shares of stock in the corporation are not protected from a judgment entered against you. Of course, it is possible that if your corporation fails to observe certain formalities, then the “corporate veil” may be pierced and your personal assets will become vulnerable to a judgment entered against the corporation. The final common type of traditional asset protection planning is established under state law and allows residents to exempt specific assets from the claims of creditors. This may include protection for property owned jointly by spouses (“tenancy by the entirety” ownership), a primary residence (“protected homestead”), the cash value of life insurance, investments held in a retirement account, and annuities. Nonetheless, these state exemptions are often subject to limitations, such as placing a cap on the value or land area of the protected homestead. You may think that only wealthy people need to do advanced estate planning such as asset protection planning. The truth is anyone who has accumulated any amount of wealth can be sued for just about any reason. The only way to protect you and your family is to engage in more advanced forms of asset protection planning such as irrevocable trusts and sophisticated business structures. We can help you go beyond traditional asset protection planning by creating a comprehensive plan that will be custom-tailored to your family situation and financial status. Please call today to arrange for your asset protection consultation. We look forward to hearing from you.